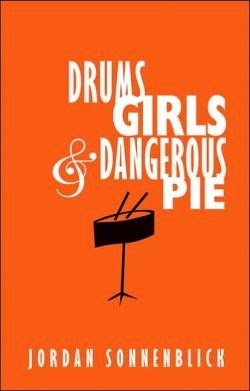 Drums, Girls and Dangerous Pie by Jordan Sonnenblick is a hysterical yet moving tale of a normal 13 year old boy who has to deal with a big problem-his baby brother gets cancer. I personally thought that this book was amazing! It was really funny, yet it was emotional; very touching in many ways. It made me cry at the end. I think that a lot of people could really relate to this book in many ways. For example, people who have gone through cancer, or have known someone with cancer can really relate to the emotions Steven's feeling. Not only is this book about family members getting sick, it's also about friends and family growing closer together. It's about community. Also, this book has a lot to do with music. Steven, the main character, is a miraculous drummer who is in a high school jazz band. That's also why I loved this book; I love music! So music lovers' great book to read! Jordan: I grew up in Staten Island, NY. My dad was a psychiatrist and my mom is a psychologist, which I think has really helped me to get into my characters' heads. I had an older sister, and we never got along until she left for college when I was 14. Now we're very close. I am married to a middle-school counselor (I just can't escape the mental-health professionals! ), and we have two kids who inspire a lot of my writing. My wife is the best first reader in the world; I am really lucky! M: What inspired you to write Drums, Girls, and Dangerous Pie? J: I used to teach 8th grade English. The year I wrote DRUMS, one of my students, an amazing girl named Emily, had a little brother with cancer. I wrote DRUMS because I wanted kids like Emily to have a book to read. M: You seem to have a lot of experience with music, do you play any instruments or anything like that? J: Oh, yeah! I have played the drums since I was 8, the bass since I was 15 and the guitar since I was 21. I can make a lot of noise if I want to. M: You seem to know a lot about Cancer, have you experienced first hand or did you do a lot of research about it? J: Lots and lots of research. Because my student really knew first-hand what it was like to live with a cancer patient, I was extremely determined to get all those details right. M: What character in Drums, Girls, and Dangerous Pie reminds you the most of yourself? J: Steven, because he's a sarcastic drummer. M: Do the characters in your books often relate to real people you know? J: Absolutely. Many of them are even named after people I like. Miss Palma was a real English teacher of mine; Mr. Stoll was my drum teacher, and Sol from NOTES FROM THE MIDNIGHT DRIVER is totally my Grandpa Sol. M: How long on average does it take you to write, edit, and publish a book? J: Writing is fast: 2-3 months. Editing might take 6 months, and then the publishers need 5 months or so for printing, sending out review copies, etc. So if you're writing a book a year, by the time one comes out, you already have the next one completely done. M: Any advice for new and aspiring authors? If you would like more info on Jordan Sonnenblick or any of his books check out his website. http://www.jordansonnenblick.com/index.php Here you can read about a few of his other books and contact info. Thanks again to my mom Kerrie Flanagan for letting me post this review as a guest blogger on her blog! My name is Delaney. I'm in middle school, and am currently a published author. My first article was published when I was 12 in a local newspaper. I live with both my parents and my older brother Drew. Also, I have 4 pets: Two dogs, a cat, and a guinea pig. If you enjoyed this review by Delaney, leave a comment down below where it says "post a comment" and let her know. Awesome interview, Delaney! You did a good job reviewing the book, since you incorporated points of view not necessarily your own. Thanks for pointing out a good read. Great book review and interview. The review was informative and comcise. The interivew gave us some insight into the author and why he wrote the book. You are a great writer and interviewer. Your questions were interesting, with wonderful insight. I can't wait to read more from you! I think you are well on your way to developing some great writing habits. It may not seem hard to interview people, but it is important to ask the right questions so readers will be interested. I applaud you. Thanks for sharing this book. I don’t think there is a person out there that doesn’t have some experience with cancer. Keep up the great work. Are you still writing poetry? I remember you working on one before the dinner started at the conference in April. I hope you stay involved with the NCW because we people with a few years on us need to know how younger people think and speak and act. Again, kudos to you for putting your review and interview out there to us. Your review and interview were both fantastic! You seem to be a very mature young lady with a very bright future ahead of you! Great review, Delaney! Keep up the good work. Do you have your own blog? If not, maybe you should. I want to read about your recent experience of sleeping in a tent with no bottom.